Viorel Tencaliuc was born on February 19, 1958 in the village of Benia, Moldova-Spear, Suceava County, Romania, of Orthodox Christian parents, Ioan and Maria, deeply involved in the life of the church. Tencaliuc attends his first years of school in his native village. In 1974, he enrolls in the Theological Seminary of Neamt Monastery and graduates in 1979. In 1979, Tencaliuc is admitted to the Faculty of Theology in Bucharest. During 1979 and 1980, he fulfills his military service. In 1982, while still a student, Tencaliuc marries Tempesu Ioana, a student at the Faculty of Civil Engineering in Bucharest. In 1983, the first child of the Tencaliuc family, Emanuel-Ionut, is born. In 1984, Tencaliuc successfully completes his thesis for the Licentiate in Theology entitled “The Savior’s Attitude Towards the Old Testament” and is declared a Graduate of the Faculty of Theology. In the fall of 1984, Tencaliuc is ordained as deacon by His Eminence Archbishop Teoctist in St. Paraskeva Metropolitan Cathedral in Iasi. A few days later, he is ordained as parish priest for Mitocasi Church in Mitocul Dragomirnei by Auxiliary Bishop Pimen. In the winter of 1984, Father Viorel Tencaliuc is appointed parish priest of St. Paraskeva Church in Mitocasi by his confessor, Father Ioan Ignatescu. In 1986, Father Viorel Tencaliuc is appointed parish priest of St. Dumitru Church in Campulung Moldovenesc by Archpriest Father Teodor Morosanu. In 1989, the second child of the Tencaliuc family, Simona-Delia, is born. In 2002, Father Viorel Tencaliuc emigrates with his family to Toronto, Canada, where with the blessing of Deputy Archbishop of the Orthodox Church in America and Canada Iosif and with a small group of Romanian Orthodox Christians, establishes a new mission in Toronto by the name of “St. Dumitru Romanian Orthodox Church”. In 2003, Father Viorel Tencaliuc establishes a second mission in Toronto by the name of “Sts. Three Hierarchs in Toronto Romanian Orthodox Church”. In 2005, His Eminence Archbishop Nicolae Condrea approves and blesses the merging of the two missions into one, named “St. Dumitru Romanian Orthodox Church”, under the patronage of Saint Dumitru the Myrrh-Streamer and Saints Three Hierachs. In July 2009, Father Viorel Tencaliuc oversees St. Dumitru Romanian Orthodox Church’s purchase of property located at 526 Carrville Rd., Richmond Hill, Ontario, L4C 6E6, where with the help of God and the faithful, the Parish will build its church. 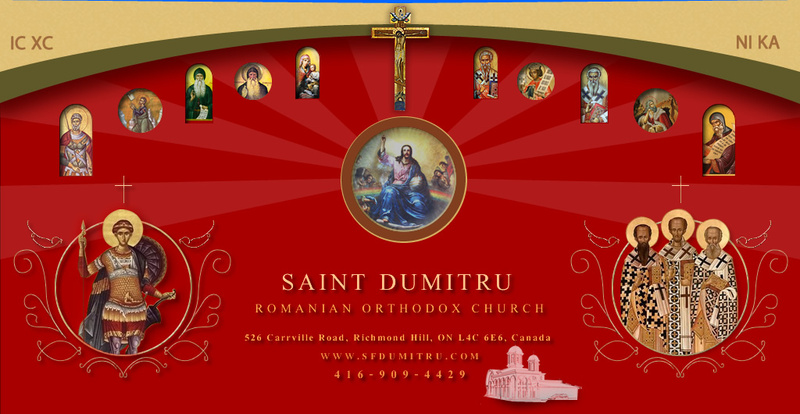 In September 2014, St. Dumitru Romanian Orthodox Church completes the purchase of land necessary to build the church by acquiring the adjacent property, located at 482 Carrville Rd., Richmond Hill, Ontario, L4C 6E6.